Chills the target, dealing 591 Elemental damage and reducing their speed by 25% for 5 rounds. Very disappointing that this is not tradeable. Most, if not all, other pets from Island Expeditions are tradeable, so why not this one as well? For me, it dropped from a "Verdant Wilds" expidition (normal). Might be related to killing a rare elite Pandaren elemental, because we killed at least one. Too bad slot 2 has both Flash Freeze and Deep Freeze. Ideally, you would want those two abilities in different slots so you could take advantage of Deep Freeze having a 100% chance to stun the target if it is chilled. 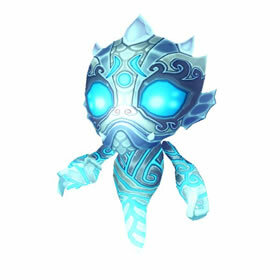 To date, only three pets have Flash Freeze, but there are several other pets that can chill a target. Dropped from a heroic "The Dread Chain with Ice Trolls" island expedition.